Personalization continues to be one of the most exciting trends in packaging. With Digital Printing, companies can easily incorporate variable graphics that allows them to personalize packaging. Targeting specific audiences in this way is a growing trend across many industries. As Digital Printing technology grows more sophisticated, personalization techniques offer additional applications—expanding beyond labels, to cartons as well. One of the best-known examples of Digital Printing in action is Coca-Cola’s “Share a Coke Campaign.” For this project, Coca-Cola personalized bottles with 250 of the top first names for millennials. Over a 10-week period, the brand printed millions of personalized labels across the country. Nosco was among the printers chosen to carry out the large-scale campaign, using the HP Indigo 6600 digital press to print the names on the labels. To push this idea one step further, Nosco demonstrated how the power of personalization could be applied to folding cartons as well. Nosco has been a partner with HP Indigo since 2004. As a result of their close relationship, Nosco was the first company in North America to install the HP Indigo 30000 Digital Carton Press. Using this equipment, Nosco is able to personalize cartons in addition to labels, which yields a thoroughly customized experience for each buyer. The digital process eliminates the need to produce printing plates. On top of that, each carton can be printed with unique graphics, including multiple colors and designs - all in a single run. How can Nosco personalize cartons? 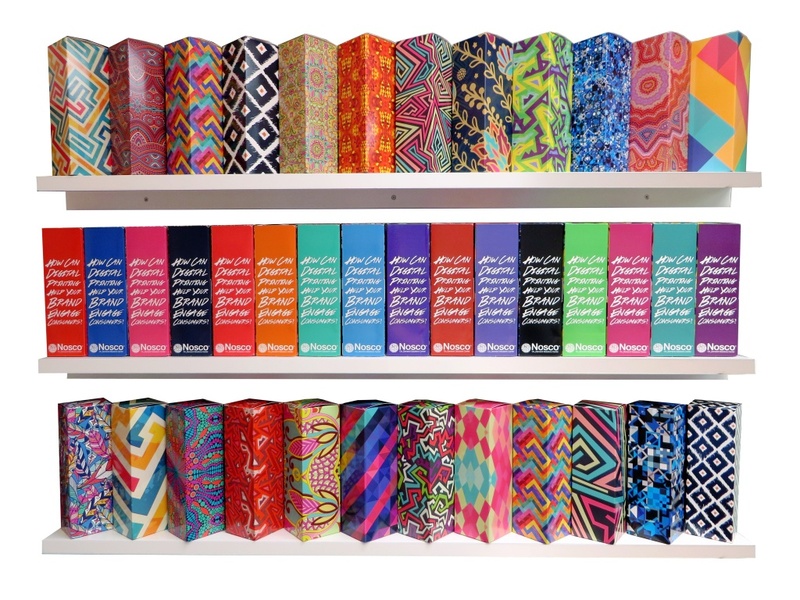 HP developed an algorithm that enables companies to create customized packaging by varying a specific job’s colors, images and text. Using this algorithm, Nosco was able to print thousands of unique cartons in one run with just the click of a button. In the end, the team transformed 16 core template designs into 1,000 unique cartons, which were then shipped out to customers. In fact, the 16 designs could have made up millions of unique cartons. Nosco packaged customized Coke bottles that they printed for the “Share a Coke” campaign in these individualized cartons to demonstrate the engaging power of a personalized packaging experience. And, it doesn’t just have to be about the first name. There are many ways to personalize the package. Personalization allows companies to engage with their customers more effectively and develop closer relationships. With technology like the HP Indigo 30000, Nosco can help brands deliver unique packaging experiences to individual target audiences. There are many ways to implement the technique, and companies have just begun to scratch the surface of what is possible. In fact, Brands can personalize through Regional Events, Sports Teams, etc. Using digital technology, Nosco is leading the way to the next generation of personalized packaging.